Fitness For The Rest of Us: Nui Foods: Soft & Delicious Cookies with 1 Gram Sugar & 1 Gram Net Carbs! Nui Foods: Soft & Delicious Cookies with 1 Gram Sugar & 1 Gram Net Carbs! 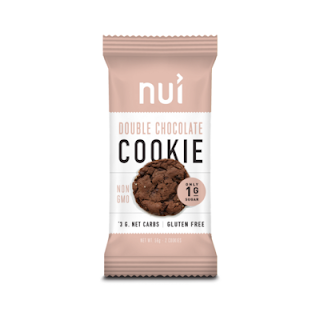 Super excited to tell you about Nui Foods, a new company offering a variety of low carb and gluten free cookies containing only two grams of sugar per serving!!! They are the perfect way to satisfy your sweet cravings on-the-go. Each package contains two generously sized soft & delicious cookies. With only 1-2 grams of sugar and 1-4 grams of net carbs- these are great for so many diet plans out there. Gluten free, low sugar, low carb, keto - check! Peanut Butter Cookie (Fan Favorite! ): Includes 2g of sugar and 4g of net carbs. Snickerdoodle Cookie: Includes 1g of sugar and 1g of net carbs. Chocolate Chip Cookie: Includes 1g of sugar and 3g of net carbs. Double Chocolate Cookie: Includes 1g of sugar and 3g of net carbs. Nui Foods cookies are the perfect treat to help people fight their sugar cravings by providing them with a gateway to make a healthier lifestyle change in favor of a low carb and low sugar diet. All varieties of Nui cookies have NO artificial sweeteners, are Ketogenic Diet friendly, and are Non GMO, Gluten Free, and have no artificial sweeteners. Honestly Sweet: Nui cookies are naturally sweetened with Erythritol and Monk Fruit Extract, which do not raise blood sugar or insulin levels. 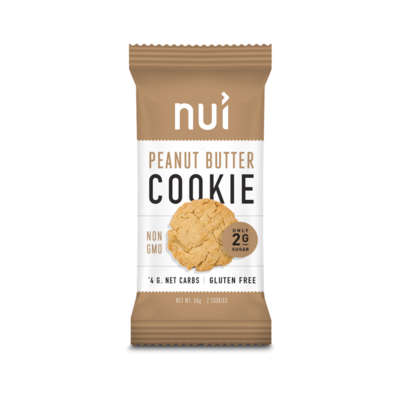 Flavorful Energy: Nui cookies are rich in grass-fed butter, coconut oil and MCT oil offering a burst of flavor and energy. Gluten Free Indulgence: Nui uses a secret blend of almond and coconut flavors packed with 6G of protein.